Lauris Reiniks has jus released the official music video for his Baltic summer song “Morning in Dandelion Fluff” (LV-“Rīts pieneņpūkās”, LT-“Rytas pienės pūke”, EE-“Hommik võilille-ehmetes”). The video is available in Latvian, Estonian, Lithuanian and a special acoustic version in English. It is a romantic story about a chemistry between two people. When that chemistry is there, all stereotypes and ideas of so called “standards” just collapse – in terms of physical appearance and financial status. Nothing can stand against these feelings. It is a story about insecurity and fears that always stand by when something “too” beautiful and “incredibly” good happens to us. 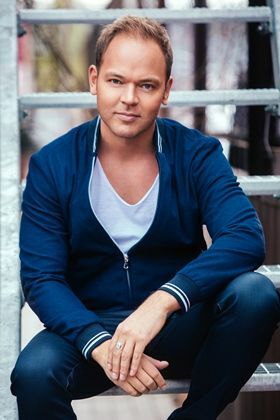 The lead role in the video is played by Lauris’s colleague- Uku Suviste, the well known Estonian singer. The lead female role is carried out by Katrina Lulle, Latvian girl who works as a PR specialist but was recognised as the best for this role in a national casting. The video shoot took place in Latvia and lasted 3 days in Mežaparks (Riga), Carnikava and Mārupe. “I wanna thank Uku for saying yes to my extraordinary and special offer. He was exactly the type we were looking for and did everything great! Also thanks to Katrina for being brave enough to jump into this world of show business, director Aija, camera man Ivo and everyone else! I am proud and happy to work with all these talented people. I hope my listeners will like this video and I’m already happy that this song has been doing really well in radio charts. Now everyone will understand what this song is about! Pictures speak better than words.”, says Lauris. Video dierector: Aija Strazdiņa (JUMP Studio), Camera: Ivo Skanstiņš (Film Studio Rafa), producer: Lauris Reiniks. Publishing: “Mikrofona Ieraksti”. Songs are available for download on doremi.lv , Amazon un iTunes.